We have a rabbit named Dexter. Dexter is actually a female but at the time it joined our house we thought it was a boy, hence naming it after my favorite fictional serial killer. Anyway, Dexter has been bleeding lately. When we first saw it a month ago I consulted my personal bunny expert and heard that she'd experienced a similar thing when her rabbit ripped a nail out in its cage. Seemed like a reasonable explanation and, after checking and not seeing anything out of the ordinary, we wrote it off as a ripped nail. The blood went away for a few weeks so we figured all was well. Fast forward to Sunday when it appeared that someone was stabbed to death in the rabbit cage given the amount of bright red blood. 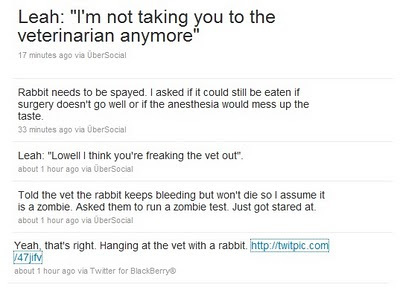 We called around to a few vets to see if they even treat rabbits. One vet clinic made a phone diagnosis of ovarian cancer and said we could bring it in to be euthanized for the weekend rate of $65.00 (I'm pretty sure I can step on an animal that size for free and have the same outcome). We decided that since it didn't appear that Dexter was in pain we'd wait until Monday to call our vet to see what to do. As it turned out we ended up talking to four different vet offices before finding one that sees small animals such as rabbits. (Yay All Animals Pet Hospital in Ames by the way). An appointment was made to take Dexter in to see the vet and Leah and I had the chat about the delicate line between wanting to keep the rabbit as a member of the family and dropping a significant amount of money on an animal that originally cost me about $20. 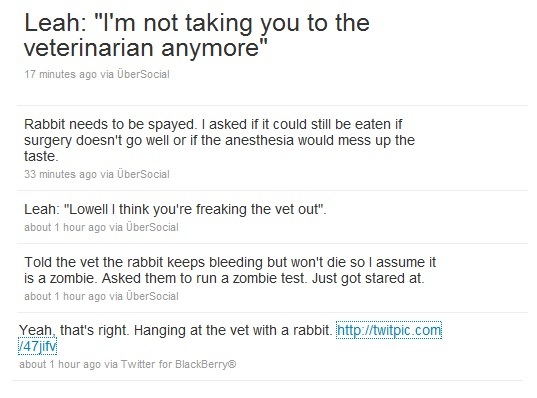 The story of our trip to the vet as told via my twitter feed is below. Those of you not familiar with Twitter (which you should be as you should clearly be following me), the timeline reads from bottom up. If you're curious, Dexter was diagnosed with blah blah blah ovaries blah blah. The cost to fix just slid in under the wire for my pre-determined acceptable amount so, as I type this, Dexter is in recovery from surgery. Freaking bunny surgery. Hopefully it will fix everything and we will continue to have him her as a member of the household for a few more years.